The Palaeontological Association aims to raise awareness of palaeontology and associated sciences via public outreach events and by awarding outreach grants. The Association is a major sponsor of the two main Fossil Festivals held annually in the UK, at Lyme Regis and in Yorkshire, and has a strong presence at both festivals, providing displays and activities for school groups and the general public. Palaeontological Association outreach grants are awarded annually, in order to facilitate innovative projects to engage the public with fossils and inspire the next generation of professional palaeontologists. 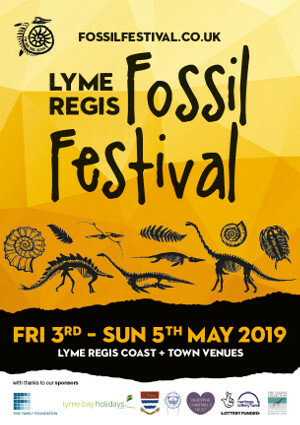 The Palaeontological Association outreach team will be delivering activities on the theme of ‘adaptation’ at the Lyme Regis Fossil Festival 2019, 3rd-5th May. Friday 3rd will be a Schools Day, with the festival open to all over the weekend. Get hands-on with some amazing fossils, and discover how their unique features adapted them to different environments and lifestyles. Design your own prehistoric creepy-crawly – decide how to spend your points to arm your creature with body parts and special powers. Then spin our ‘wheel of fortune’ to see what life throws at it – is your animal equipped to survive a meteorite impact, climate change or the arrival of a new predator? Palaeoartist James McKay will be on hand to bring the public’s fantasy fossils to life. In response to feedback, we are extending the deadline for contributions to our new PalAss YouTube channel and clarifying the process of video production. The YouTube channel is being developed as part of our response to the results of the 2018 PalAss diversity study, in order to reach out to a broader and more diverse audience. Awards are made to encourage educational outreach, public engagement, and related initiatives in palaeontological themes. The Palaeontological Association outreach team will be delivering activities on the theme of ‘adaptation’ at the Yorkshire Fossil Festival 2019, which will be returning to Scarborough on 13th-15th September. Schools will be given priority on Friday 13th, with the festival open to all over the weekend.